Seven badges by Julian Morey from Stereohype's B.I.O. (By Invitation Only) Series 14. 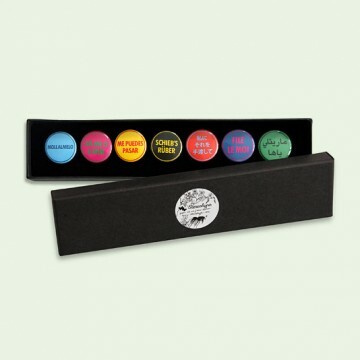 Fifty years after Richard Hamilton’s Epiphany (1964) was first published International Epiphany – a set of seven button badges – celebrates Hamilton’s original artwork. During a trip to America in 1963 Hamilton came across a button badge which became the inspiration for his large-scale homage to Pop Art. “I sometimes wonder,” Hamilton muses, “if a sudden epiphany hit Marcel Duchamp when he picked up a bicycle wheel and put it through a hole in the top of a kitchen stool in 1913. I experienced such a moment of understanding when I encountered a large button in a seedy gift shop in Pacific Ocean Park, Venice, California, with the words SLIP IT TO ME blatantly displayed across it. The greatly enlarged version which I characterized as a work of art was entitled Epiphany.” Something akin to a reverse engineered multiple of Hamilton’s original design International Epiphany reworks the concept across seven primary colours and seven international languages. Cyan/Navy: Italian, Magenta/Green: Portuguese, Yellow/Red: Spanish, Black/Yellow: German, Red/Cyan: Japanese, Navy/Magenta: French and Green/Black: Arabic. Single badge SKUs: B0952B14, B0953B14, B0954B14, B0955B14, B0956B14, B0957B14, B0958B14.